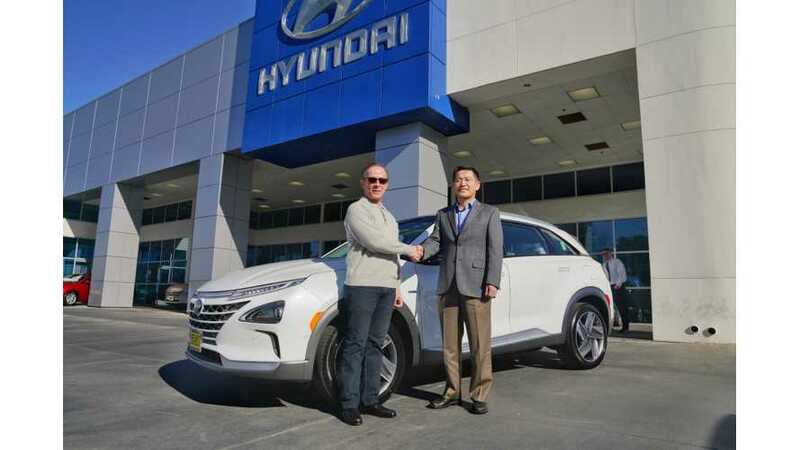 Hyundai Delivers First Nexo Fuel Cell SUV In U.S.
Hyundai has delivered its first NEXO hydrogen fuel cell SUV in the U.S. market. The car went to a former scientist and chemist Todd Hochrad of Ventura, California. "Mr. Hochrad isn’t the typical automotive buyer, yet he’s the sort of customer looking to drive a zero-emissions, hydrogen-powered vehicle. More than 15 years ago, he purchased his first hybrid car and over the years has driven dedicated electric vehicles as well. His new NEXO will deliver about five times the driving range of his first all-electric car." The NEXO was introduced in South Korea earlier this year and Hyundai sold around 600 through the end of November. 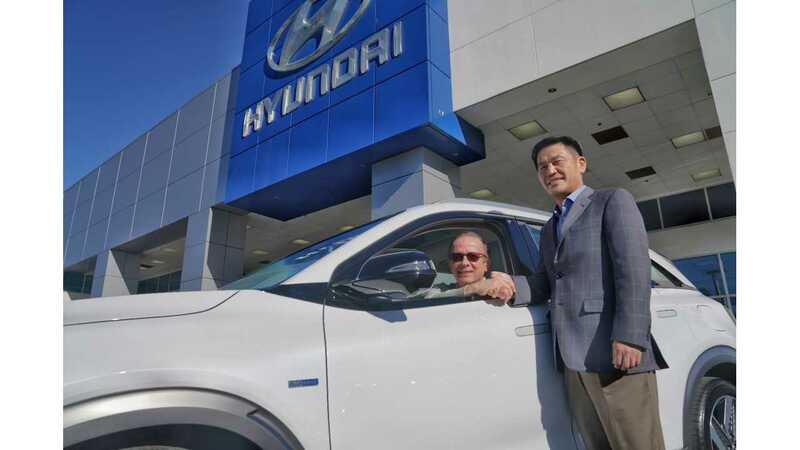 Hyundai believes that FCVs are the future of automotive, spending billions on hydrogen fuel cell investments and the FCV platform, but at least for now Kona Electric alone attracted 10,000 sales in South Korea in a fewer number of months. "NEXO can be leased for $399 (Blue model) or $449 (Limited model) for 36 months and can be purchased for $58,300. The first year of maintenance is free of charge and customers are eligible for a tax credit (subject to individual tax circumstances) from the state of California for up to $5,000. Purchasers of new Hyundai NEXO SUVs will receive hydrogen fueling cards with a combined maximum value of $13,000 to be used during the first three years of vehicle ownership." NEXO is not only perfectly clean, emitting only water, but a technological dynamo. It offers a number of advanced driver assist systems, including Forward Collision-Avoidance Assist, Lane Following Assist, Driver Attention Warning, High Beam Assist and Remote Smart Parking Assist that enables NEXO to either autonomously park or retrieve itself from either a parallel or perpendicular parking space with or without a driver in the vehicle. Additionally, Hyundai’s Blind-spot View Monitor is an industry-first technology that projects the side views of NEXO in the center cluster to the driver using cameras while changing lanes with the turn signal on that monitor areas that cannot be seen by a traditional rearview mirror. The NEXO Blue model has an estimated range of 380 miles, 115 more than the Tucson Fuel Cell Electric Vehicle. The NEXO Limited Trim has an estimated range of 354 miles. NEXO Blue models have estimated MPGe of 65 city, 58 highway and 61 combined, while NEXO Limited models have an estimated range of MPGe of 59 city, 54 highway and 57 combined. NEXO refueling time can be achieved in as little as five minutes, allowing a consumer lifestyle very similar to a comparable gasoline-powered SUV in terms of range and refueling speed. NEXO uses a number of ecological materials in its construction, including soybean-oil based polyurethane paint, bamboo-thread-based bio fabric, along with bio-plastic and bio-carpet extracted from sugar cane. Bio-based materials were applied to 47 different parts and reduced CO2 emissions by 26 lbs. during the manufacturing process. Not only is Hyundai’s NEXO fuel cell vehicle built with an exclusive dedicated vehicle architecture and a design that sets it apart from every other vehicle on the road, it is vastly improved over the Tucson Fuel Cell it has replaced. It is quicker, roomier, more efficient and better packaged, all while offering 40 percent more range. Since it launched the Tucson Fuel Cell four-and-a-half years ago, customers have accumulated almost 6.9 million high-mileage – and safe – miles on America’s roads, all, of course, with refueling times that mirror the convenience of gasoline vehicles. And just recently, the Hyundai NEXO was named a winner of the prestigious Wards’ 10Best Engine award, further highlighting its position as a high-tech and user-friendly vehicle.